Home » untethered » Is it worth to Untether Jailbreak Apple TV 2 iOS 4.3.1? Is it worth to Untether Jailbreak Apple TV 2 iOS 4.3.1? It seems that there is still some issues in XBMC after Jailbreaking Apple TV 2 to iOS 4.3.1. It has been reported in some forum like Forum XBMC. Problmes such as SMB not working, No Sound, etc. I have also asked nitoTV personally and got his reply today. 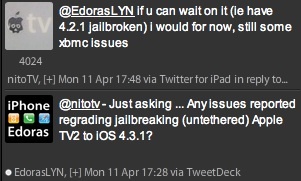 Now the question remained - Do you still want to Jailbreak your Apple TV 2 with iOS 4.3.1?